The Luv Boat is the wider of the two skis in K2&apos;s Freeride collection of powder-ready fat skis. Its metal-free construction and tip tapering keeps it lively, light, and loose in the snow. 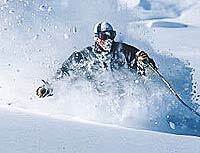 Its 108-mm waist width will float and smear in deep powder. The Freeride collection includes two wide-waisted soft-snow specialists, the 108-mm Luv Boat and the 98-mm FulLUVit. Both are flat tailed, "directional" designs built for a secure, traditional feel. (As opposed to the looser, smearier twintips of K2&apos;s Freestyle collection.) Both models have tapered tips, where the widest part of the ski is moved back from the tip, for lighter swing weight and a slashy, quick feel in deep snow. K2&apos;s Bioflex cores feature flex patterns specifically tuned for the needs of women, with lighter woods down the middle for reduced swing weight and denser wood over the edges for solid edge grip. Channel Light Cores have grooves milled into them tip to tail to reduce weight and soften flex. The Luv Boat&apos;s core is a mix of aspen, paulownia and bamboo, wrapped in fiberglass reinforcement. HybriTech Sidewall construction combines a sturdy vertical sidewall underfoot for edge grip, lightweight cap fore and aft for supple flex. Moderate rocker adds a measure of surfiness in soft snow and powder as well as shock absorption in rough terrain; camber underfoot promotes positive edge grip and adds rebound energy.